So, you want to be the Nintendo World Champion of 2017? First off, you’d better be from the United States or Canadian, and that doesn’t count Quebec. So much for “World” Championships, I suppose. Second of all, you’d better be good at Mario Kart 7, because that’s the game you have to be good at to get in; nothing else. Thirdly, you’d best be prepared. Here are my educated guesses at what Nintendo is likely to throw at you for the Nintendo World Championships of 2017. There were eight games at the 2015 Championships, so it’s safe to say that there will most likely be eight games at the 2017 championships. These are the games that are almost certain to be at the championships, due to their inherently competitive nature and recent release. Remember, this is basically one big advertisements for all of Nintendo’s games, and they want to showcase their most recent games first. In the 2015 Championships, they had Splatoon, which was a very recent game at the time. Here, in the 2017 Championships, Splatoon 2 came out this past month and will only be a few months older once the Championships arrive. This will likely be one of, if not the first game played, due to how many people are needed for one match. It adds a fun, almost “Hunger Games” dynamic, since some of the players that are teammates in Splatoon 2 might end up being competitors later in the tournament. Who knows; we might even have the players fight on a new stage that we’ll get to play a few days later! ARMS only came out a month before Splatoon 2, so it’s still fairly recent, and it’s a competitive fighting game. Like Splatoon 2, we might have a new character or stage where they play on, although it’s highly unlikely that any players would choose the new character. It’s not impossible though, as a player chose a DLC character for Super Smash Bros. that had been released earlier that day! Closing out the three obvious choices for Nintendo is Mario Kart 8 Deluxe. They had Mario Kart 8 at the World Championships 2015, so it makes sense that they would have their new remake of it for the system Nintendo’s trying to sell. However, I highly doubt that there will be any new courses or characters for this game. Nintendo has given no indication that they would add anything to this game, and adding DLC to a game that was already supposed to be the “definitive edition” kind of seems like a jerk move. All the same, I can’t wait to watch some sweet Mario Kart 8 Deluxe action! These are games that Nintendo might or might not show, as there are factors working both for and against them. Super Smash Bros. for 3DS and Wii U were two of the biggest games for Nintendo in recent years, but will they have it here again? And if so, in what form? If they choose the Wii U, they’re promoting a console that they have made quite clear they’re trying to get everyone to forget about, but they do have the best-looking version on stage. If they choose 3DS, then they’re promoting a system that they obviously are still supporting with the New 2DS XL, Pokemon Ultra Sun and Ultra Moon, and even the newly announced Metroid-themed New 3DS XL, but that will look horrible on the big screens. Still, they weren’t shy of showing 3DS games on the big screen with Metroid Prime: Federation Force (although we didn’t know that was the game’s name at the time), so it’s very possible that it could happen again. Maybe Nintendo will do something crazy, (always a distinct possibility) like have Brawl, Melee, (a fan favorite), or even the original N64 version?! Probably not, but I like to have all my bases covered. It might be more likely if they’re playing a newly announced port of Melee on Switch, however. Another possibility is that a Switch version is announced before or at the Championship, and then the competitors play it, again, not unlike what happened with Federation Force. If Sakurai is crazy (which he is) and wants to make a new Smash Bros. game from scratch, there could be the core characters that always make it in, and they could fight that way. If it is more or less a port of the Wii U and 3DS versions, then they could possibly have access to the entire roster from those games. 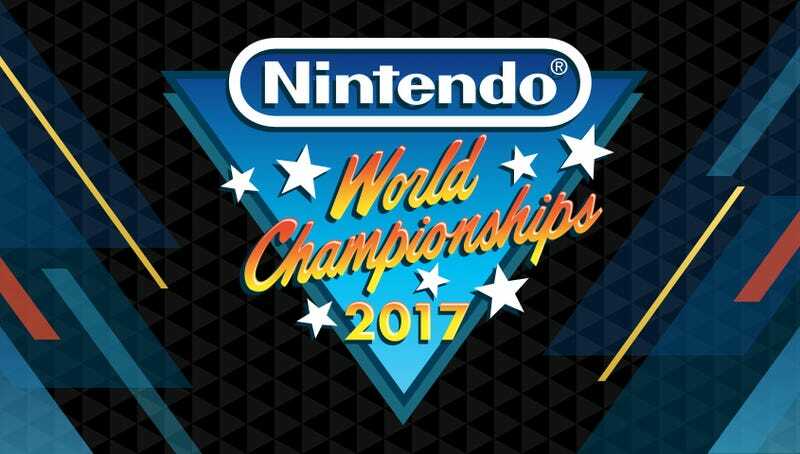 I don’t know which will happen, but at any rate, I think it’s safe to say that Smash Bros. will be at the Nintendo World Championships 2017 in some form. In the 2015 Championship, people who lost at Splatoon, Mario Kart 8, etc. had a chance for redemption in the loser’s bracket. All of these games were retro, and were played on the Wii U virtual console. It is entirely possible that there might not be a loser’s bracket, and even if there is, they might not be retro games. But let’s suppose that they are. Nintendo could certainly choose the same ones they chose in 2015, speedrunning parts of The Legend of Zelda, Super Metroid, and Balloon Fight. But would they still have them running on the Wii U virtual console? Again, remember that Nintendo wants everyone to forget about the Wii U so they go out and buy a Switch. The only way Nintendo is still supporting the Wii U is with the Champion’s Ballad DLC for Breath of the Wild, and they’re only doing that because of the fan outcry at Nintendo going back on their word if they were to not release it on Wii U. Therefore, I think that even if Nintendo has Super Smash Bros. on Wii U out of necessity, there is no way that they will have their virtual console games running on Wii U. Here are some ways Nintendo could address this problem: They could either announce virtual console for Switch before or at the event so that the competitors could play on Switch. This would let people know that virtual console is on Switch for a wide audience, but I don’t think that Switch is getting virtual console of any form for the rest of 2017 because of the SNES Classic. However, I do think that Nintendo could show games from the SNES Classic to promote that product, which would have just released the month before. Of course, we all know that Nintendo could say literally nothing about the SNES Classic and have it release in a secret bunker on an unannounced day, and they would fly off the shelves, but Nintendo seem to be oblivious to their own popularity, sometimes. Having an NES Classic would make considerably less sense, even though it released just last year, since production of the product has officially ended, meaning that Nintendo aren’t trying to sell the product anymore. In a way, having the NES Classic present would take away attention from the SNES Classic just as much as having the Wii U present would take away attention from the Switch. If Nintendo goes this route, Super Metroid might return, but The Legend of Zelda and Balloon Fight are out. We could get A Link to the Past to replace the original, and have a speedrun of Star Fox 2, since that game will be releasing for the first time on the SNES Classic. Finally, Nintendo could just decide to have everyone play the virtual console games on 3DS, as they’re still promoting that product. The New 3DS and 2DS can play SNES games, so it could be the same three games if Nintendo decides to go that way. Much like Super Smash Bros., there’s a high chance of retro games returning in some form; It’s just impossible to definitively say what games will be selected, and how they will be played. I’ve spent the last hour staring at the screen, trying to think of what Nintendo’s last game might be, and I have no idea. This is their wild card. It could be like Super Mario Maker or Federation Force, where they have them compete in a game that they haven’t had any time to play beforehand because the game isn’t even out yet. Hell, we might have Super Mario Maker ported to Switch, or they could play the 3DS version. (I feel like I’m repeating myself a lot here.) Lord knows there won’t be a Federation Force remake. Or they might speedrun Metroid: Samus Returns or Super Mario Odyssey, as the former would have just released and the latter will be releasing a few weeks after. Or, there’s the possibility that they might play a completely original game that none of us could have thought of. How about a “Zelda Maker” that looks like the 8-bit tech demo they showed a few months ago? The possibilities are endless. Reggie training for the Nintendo World Championships 2015. It didn’t go well, but at least his training video was hilarious. At the Nintendo World Championships 2017, there was a before-the-event pre-show. They played a bit of Yoshi’s Woolly World (the game wasn’t out yet) and then they announced that Earthbound Beginnings, known in Japan as the original Mother, was coming to the west through the Wii U virtual console! I don’t want to get people excited, because Mother fans have been burned many times before, but maybe Mother 3 will be announced at the Nintendo World Championships 2017. I’m not saying it’s likely, but I’m just saying that there is a precedent for previously-untranslated Mother games being announced that they are being translated and brought to the west at the Nintendo World Championships. Just something to think about. It would figure that they’d finally announce Mother 3 right after I bought the fan translation, though.